In order for you to make sense of the intent of this book – The Michael Letters: Heaven’s answer to Screwtape – you may first have to read C.S.Lewis’ famous classic The Screwtape Letters. Even having read Lewis’ book I found this one a little hard to ‘get’. Jim Peschke‘s writing is good – the archangel is writing to a guardian angel whose main focus is on a man who is struggling with his faith. All through the book other people in this man’s life are mentioned, sometimes pulling the focus off the main character, but making connections to his life. The angels address his conflicts with his mother, his interest in a lady friend – even talking about her being overweight, his problems at work, and his worries about being a charitable person. There were a few places in what the angels were believing where the author did not line up with Scripture. This may be a matter of interpretation, but if I may give an example: “The Son came to wonder if he could die for mankind’s sin.” This is not quite accurate; Jesus never doubted His mission and godship, although as man he was not welcoming the suffering He knew was coming. The Michael Letters is an entertaining read, not C.S.Lewis standard but the author claimed to not pretend to write the same as Lewis. He does give a modern reply by angels to what the devil and helper were saying in The Screwtape Letters. 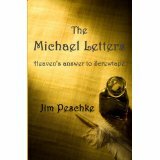 You can find The Michael Letters: Heaven’s answer to Screwtape listed on my BUY THE BOOK! page. This entry was posted in Mostly About Reading, Reviews & Interviews and tagged C.S.Lewis, Jim Peschke, letters to guardian angel, religious fiction, The Michael Letters, The Michael Letters: Heaven's answer to Screwtape, The Screwtape Letters. Bookmark the permalink.